Shelly Danz is the founder/chief party officer of Atlanta Party Connection and produces the twice-yearly Bar & Bat Mitzvah EXPO. Dodging raging hormones, talking about the birds and bees, and navigating online activity for tweens? They’re nothing compared with planning a bar or bat mitzvah celebration. Imagine family arriving from near and far, celebrations from Friday to Sunday, music, centerpieces, kosher meals, and more. It’s enough to make you hop a plane to Israel. 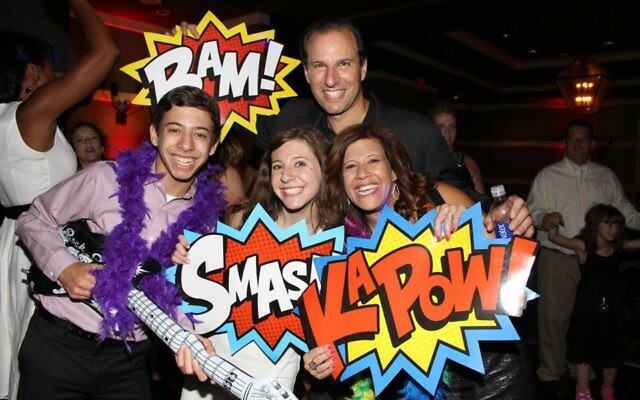 Before you call El Al, take some advice from two of Atlanta’s mitzvah expo mavens. Shelly Danz makes Atlanta Party Connection’s semiannual mitzvah fairs into family affairs. Shelly Danz of Atlanta Party Connection is a party planning connoisseur. She hosts the largest mitzvah expo in Georgia, bringing more than 70 vendors to Atlanta’s northern suburbs twice a year. Jill Waddell of Mazel Tov Atlanta is bringing her first mitzvah expo intown Sunday, Sept. 25, at the Emory Conference Center Hotel from 1 to 5 p.m.
Visit the expo more than once. Danz said most families attend at least twice, sometimes more. Once the bar or bat mitzvah student receives a date, all systems are go. Families first attend an expo to get ideas and figure out a budget. The expo is the ideal place to wander the aisle, look at pictures from other parties and talk to vendors. The second visit is for engaging vendors and putting on the finishing touches to the weekend. Every expo hosts new vendors. At the August Atlanta Party Connection expo, desserts were a big deal, from a create-your-own-cupcake bar to an ice cream bar with liquid nitrogen. In spring Danz will feature a bat mitzvah dress resale shop. Doing a mitzvah is part of the deal. In partnership with Jewish Family & Career Services’ Kosher Food Pantry, the Atlanta Mitzvah Expo is requesting a kosher food item instead of an entry fee. “We want to encourage kids to use community service in their bar mitzvah projects, to practice giving it forward,” Waddell said. Camp counselors from Camp Oasis at Twin Lakes will run a bowling activity at the conference center’s Wisteria Lanes. Alternative celebrations are represented. Want something different from a traditional black-tie evening celebration? Unconventional venues represented at expos include Stars and Strikes, Andretti Indoor Karting and Gaming, and Top Golf. Families still need music, a photographer, invitations and religious items. Take all the help you can get. Danz’s website features a detailed, time-scaled to-do list. She also provides party-planning services, offering services from consulting (looking over a family’s plan) to hands-on planning (booking vendors and attending the event). Atlanta Party Connection is online at www.atlantapartyconnection.com. Mitzvah Expo launches its first event Sept. 25; details can be found at www.mazeltovatlanta.com.